Pressure sensitivity, with respect to the ear, generally consists of dizziness induced by transient alterations in pressure in the inner ear, middle ear, or external ear. Canal fistulae -- such as cholesteatoma and post-fenestration surgery. An example of dizziness induced by inner ear pressure changes might be dizziness associated with the Valsalva maneuver. This is a straining maneuver that increases pressure in the spinal fluid and inner ear perilymph space. Superior canal dehiscence is the main cause of Valsalva induced dizziness. An example of dizziness induced by middle ear pressure fluctuation is "alternobaric vertigo" -- such as occurs in people who can "clear" one ear, but not the other. (Tjernstrom 1974; Tjernstrom 1974; Tjernstrom 1974; Klingmann, Knauth et al. 2006; Subtil, Varandas et al. 2007). This is mainly a problem in scuba divers and airplane pilots. It seems likely that this syndrome is either caused by asymmetry in inner ear pressure accompanying changes in middle ear pressure, or due to displacement of otolithic membranes associated with displacement of the ossicular chain accompanying an inequity between middle ear and external ear pressure. An example of dizziness induced by external ear pressure is dizziness associated with perilymph fistula, when people get dizzy when they stick their finger into their ear. Vestibulofibrosis causes very strong and reproducible dizziness of this nature -- generally much greater than that which is produced in persons with window fistulae. Dizziness due to pressure also occurs in the conditions that cause Tullio's phenomenon -- Superior canal dehiscence, perilymph fistula, Meniere's syndrome, post fenestration surgery, and vestibulofibrosis (Nadol, 1974; 1977). Movie2 of nystagmus elicited by pressure in person with R SCD (courtesy of Dr. Dario Yacovino). A related group, but not quite identical, are persons who are sensivity to the ups/downs of barometric pressure. It seems most likely that this pattern reflects an interaction between barometric pressure, migraine, and inner ear disturbance. Barometric pressure (and weather fluctuations) are a powerful trigger for migraine, and migraine is a powerful modifier of sensory input. People with migraine are often very sensitive to light (photophobia), sound (photophobia), smell, motion (if they have a vestibular system -- 5 times more motion sensitive), medications, sensation (called allodynia). This is due to a pervasive increase in central sensitivity to sensory imput. Pressure sensitivity is a symptom, not a disease, so you diagnose it by simply making the observation that pressure fluctuations makes a person dizzy. It is particularly important to try to determine which ear is the problem. The next step should be to consult with a doctor who knows something about this. Generally this will be an otolaryngologist who specializes in ear problems (an otologist). This doctor will likely do a hearing test, take a careful history, and get a temporal bone CT scan to look for superior canal dehiscence and other ear problems. Treatment is based on the cause. Generally it is surgical and not terribly effective. Fistulae can be patched, Meniere's can be treated medically and surgically. Superior canal dehiscences can be cloased. Fenestrations may be closed, although this is done very rarely. Vestibulofibrosis can be treated with approaches that destroy vestibular function, disconnecting the ear from the brain. More practically, you may find it useful to wear "ear plane" plugs, and avoid things that make your ear pop. Klingmann, C., M. Knauth, et al. (2006). "Alternobaric vertigo--really a hazard?" Otol Neurotol 27(8): 1120-5. Subtil, J., J. Varandas, et al. (2007). "Alternobaric vertigo: prevalence in Portuguese Air Force pilots." Acta Otolaryngol 127(8): 843-6. Tjernstrom, O. (1974). "Function of the eustachian tubes in divers with a history of alternobaric vertigo." Undersea Biomed Res 1(4): 343-51. Tjernstrom, O. (1974). "Further studies on alternobaric vertigo. Posture and passive equilibration of middle ear pressure." Acta Otolaryngol 78(3-4): 221-31. Tjernstrom, O. (1974). 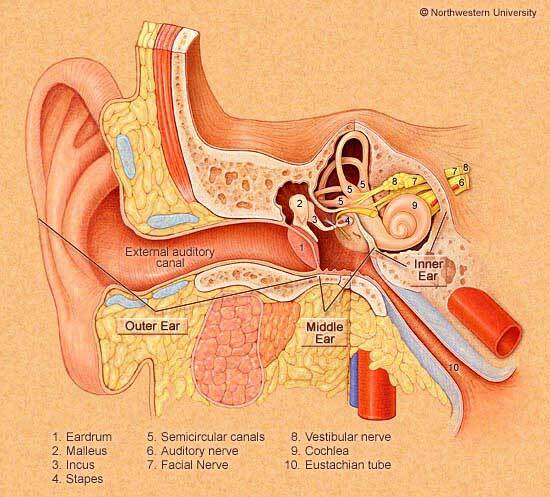 "Middle ear mechanics and alternobaric vertigo." Acta Otolaryngol 78(5-6): 376-84.